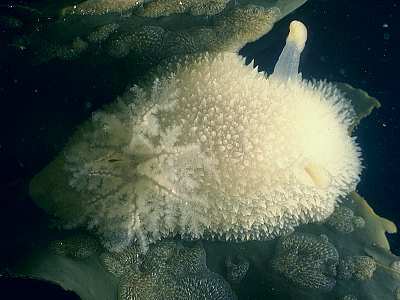 Description: A. pilosa is easily distinguished from other British nudibranchs by its overall 'fluffy' appearance, caused by the presence of long, soft papillae all over the back of the animal. 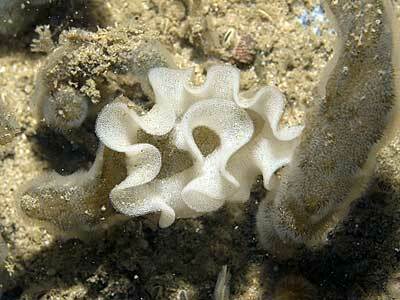 The rhinophores are long, with long shafts below the lamellate portions; the gills are large and fluffy. Colour is variable from white through brown and purple to black. Mature specimens of A. pilosa are usually 30mm in length but may reach almost 70mm. Habitat: The prey of A. pilosa consists of encrusting bryozoans such as Alcyonidium hirsutum and Flustrellidra hispida on shore and the erect fleshy bryozoan Alcyonidium diaphanum in the sublittoral. Distribution: Common all around the British Isles and from NE America to the Mediterranean. Similar Species: The large rhinophores and the long, soft papillae distinguish this species from any other British nudibranch. Rounded body with long soft papillae all over. Picton, B.E. & Morrow, C.C. (2016). Acanthodoris pilosa (Abildgaard in O F Müller, 1789). [In] Encyclopedia of Marine Life of Britain and Ireland.